Written by Yancey Common Times Journal. This story is published by Carolina Public Press through a content-sharing agreement with the Yancey Times Journal. This photo, taken at the EnergyXchange, shows part of the night sky at the Blue Ridge Observatory and Star Park, which will be located outside Burnsville, in Yancey County. Photo by Todd Bush and republished courtesy of Yancey Times Journal. The Appalachian Mountains of North Carolina have stood as silent witnesses to the uninterrupted, nightly rain of starlight for nearly a half-billion years, but artificial light now threatens this nightly show. 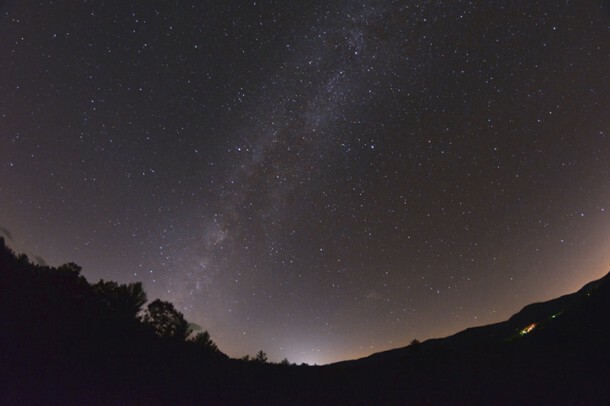 In honor of notable local efforts to preserve the natural nighttime landscape of Western North Carolina, the International Dark-Sky Association (IDA) announced Feb. 21, 2014 it has designated the first International Dark Sky Park in the southeastern United States. In recognizing the Blue Ridge Observatory and Star Park that will be located in Yancey County, IDA is pleased to acknowledge the work of Mayland Community College (MCC) in preserving a threatened dark-sky location while advancing its educational mission and vision of bringing the experience of primeval night to locals and visitors alike. The Blue Ridge Observatory and Star Park will be located off N.C. Highway 197-N, off N.C. Highway 19-E at Newdale, just east of Burnsville at the old landfill site. The six-acre site is owned by Yancey County and managed by MCC. It is co-located with the EnergyXchange, a project in which methane waste gas emitted by the old landfill heats horticultural greenhouses and artists’ studios. Jon Wilmesherr, MCC director of the Learning Resources Center and Distance Education, who led the effort to secure the IDA award, is optimistic that the Star Park will serve as a model for land management by other colleges and universities. “I hope other educational institutions will consider the benefits of sponsoring an IDA star park, where the demonstration of lighting conservation can lead visitors to a better understanding of the urgent need for the preservation of the natural night sky,” Wilmesherr said. The Blue Ridge Astronomy Group (BRAG), a local amateur astronomy society, was instrumental in supporting MCC’s application to the Dark Sky Places Program. The 34-inch telescope has already been built and, when installed, will be the largest observatory telescope in North Carolina, the largest dark sky public telescope in the southeastern United States and one of the largest public telescopes in the world. Community members also participated in the IDS application process. Hampton, BRAG and its members supplied all the technical dark sky and star data that was required. Professional photographer Todd Bush captured astrophotography that shows the beauty of the night sky over the EnergyXchange. Wilmesherr retrofitted all the existing outdoor lighting at the park with new state-of-the-art Cree LED light bulbs. Burnsville architect Armin Wessel designed the observatory that will be built on the site. This designation was gained from a collaboration of educational and other outreach events organized by Mayland Community College, the Yancey County Chamber of Commerce, Yancey Economic Development Commission and The Blue Ridge Astronomy Group. These efforts have resulted in Star Parties in a variety of locations since 2010. The Star Parties have been held on Mount Mitchell, Stars on the Square in Burnsville and at the EnergyXchange, the future site of the observatory.